A streetfighter teams up with a hustler to make some quick cash. With Walter Hill back in the headlines for the wrong reasons with his controversial Tomboy (aka The Assignment), it's a fitting opportunity for a hi-def release of his 1975 debut, Hard Times. 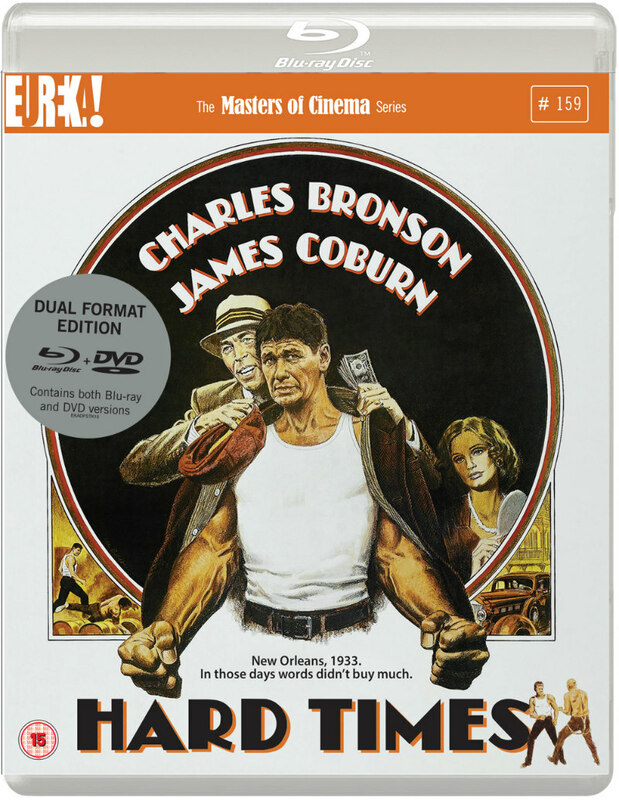 Part of 1970s Hollywood's fad for movies set during the Great Depression, Hard Times stars Charles Bronson as Chaney, a drifter who emerges from a boxcar in Louisiana in search of a quick buck. Opportunity knocks when he hooks up with Speed (James Coburn), a smooth talking hustler who manages bare-knuckle boxers on the New Orleans circuit. Speed takes Chaney under his wing, and the two men embark on a mutually beneficial campaign of administering beatings to all comers. Hill's films would later be lauded as much for their crackerjack dialogue and character play as for their tautly constructed action set-pieces, but Hard Times is as verbally sparse as a Jean Pierre Melville thriller, which was likely the director's intention. With The Driver a few years later, Hill would pull this sort of storytelling off with aplomb, but in Hard Times it often comes off as overly affected and frustrating. Much of this is due to the casting of Bronson. Despite being in his fifties at the time of shooting, the actor was in peak physical condition, so he certainly looks the part, but he lacks the charisma to pull off the strong silent hero archetype he's asked to essay here. Bronson is so dry here that at times you wonder if he's actually awake, and in his scenes with Coburn, all the energy is coming from one direction. Even though they were married in real life, Bronson and Jill Ireland, as the under-written love interest, portray a palpable lack of chemistry in their interactions. Thankfully Coburn and the great character actor Strother Martin, as Chaney's oddball 'cut-man', cover up some of the cracks left by the absence of a pulse from Bronson. The highlight of the film is its closing scene, in which the two men share a tender moment of reflection, and you're left wishing the movie had focussed on their relationship rather than the one-note Chaney. Beginning with his next outing, Hill would embark on one of the most exciting runs of any American filmmaker of his generation - The Driver, The Warriors, The Long Riders, Southern Comfort, 48 Hrs. - and while Hard Times pales in comparison, it does hint at the great genre pieces the director would go on to gift us. From the off, Hill establishes himself as a no nonsense filmmaker in the Howard Hawks mode. There are no showy camera moves or flashy editing; rather Hill simply places his camera where it needs to be, and cuts when a cut is required. For a debut movie, Hard Times is assured and confident in its direction, even if its script and leading man could both use a shot of adrenaline. Audio and video interviews with Walter Hill, composer Barry De Vorzon and producer Lawrence Gordon, original trailer and a booklet featuring new writing and archive imagery. 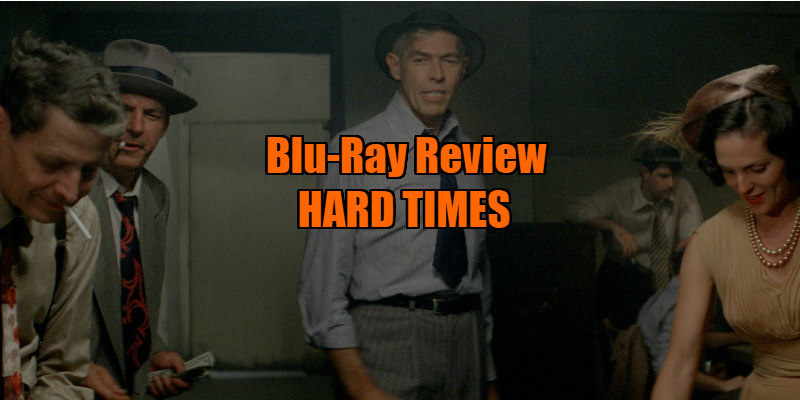 Hard Times is available on blu-ray April 24th from Eureka Entertainment.